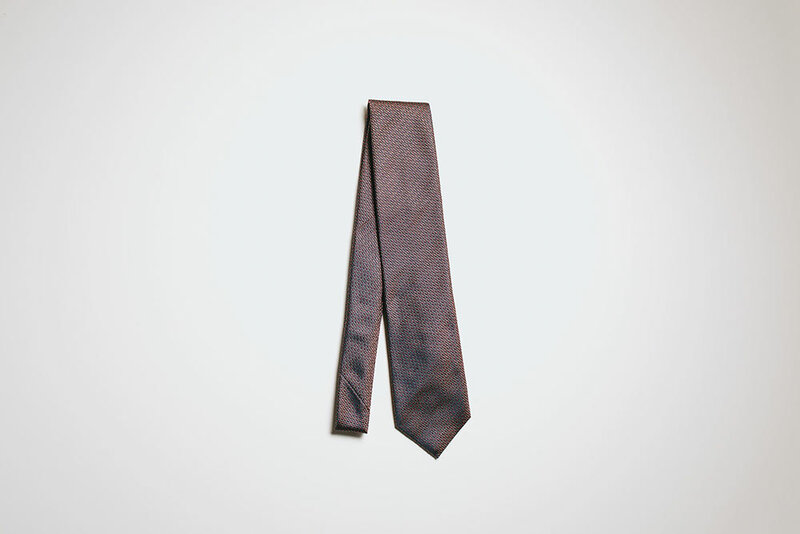 "The necktie is a window of opportunity to express a unique interpretation of winter, business-formal dressing." In the cooler months, accessories including neckties assume an entirely new purpose – bearing practicality of warmth as much as elevating one's appearance. Taking into consideration that most men are often suited in sombre shades of navy and grey, the necktie is a window of opportunity to express a unique interpretation of winter, business-formal dressing. As with other seasonal garments, fall/winter brings forth a different emphasis to spring/summer, factoring a change in colours and patterns, textures, constructions and fabric compositions - each, play a significant role in creating an altogether distinctive appearance that is often associated with winter. While it is important to build a core selection of neckties in the business wardrobe that is versatile throughout various seasons, we also encourage curating a seasonal range for a substantive 'winter' look which can differentiate itself entirely from its summer counterpart. Here, we recommend switching out silk neckties in a spring/summer-appropriate unlined construction for ties crafted lined instead - adding a slight heft that best suit the mood for fall/winter, and anchoring a winter ensemble altogether. For good measure, also consider fabric compositions such as the likes of cashmere and wool-silk blends which potentially complement made-to-measure tailored suiting in winter fabrics better. While the former has a luxuriously soft handle and renowned for its lightweight properties, the latter introduces a myriad of intriguing textures that are often favoured amongst enthusiasts – essentially, it is what makes dressing up in the mornings particularly enjoyable. Furthermore, explore subtle patterns that can create some form of contrast to more conservative solid navy and grey suiting - stripes, cross-hatch and even paisleys, for instance, make for interesting variations which can still be complemented alongside business suits. Or consider colour as an alternative - earthy tones including burgundy or olive green perform particularly well here. Accessorise the necktie appropriately this fall/winter. It’s tempting to look upon the upcoming winter as a time of sartorial hibernation but nothing could be further from the truth - it is possible to look as good as you feel, and feel as warm as you look this winter.